Railpictures.ca - Bill Thomson Photo: One of CN’s business cars (possibly CN car 94) trails on VIA #64 at Kingston station in 1992. CN painted their business/official and track inspection cars in the same blue/yellow paint as VIA’s ex-CN equipment, but with CN logos instead of VIA. | Railpictures.ca – Canadian Railway Photography – photographie ferroviaire Canadienne. Caption: One of CN's business cars (possibly CN car 94) trails on VIA #64 at Kingston station in 1992. 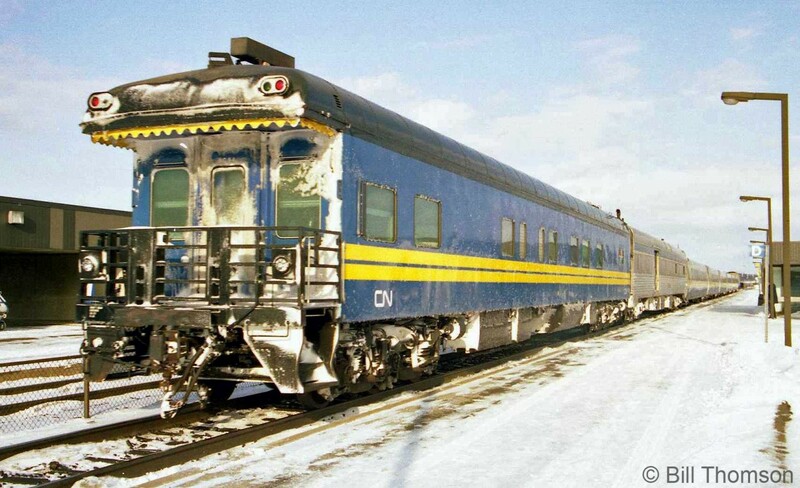 CN painted their business/official and track inspection cars in the same blue/yellow paint as VIA's ex-CN equipment, but with CN logos instead of VIA. Yes, that is CN 94, ex-CN 99 ‘Bonaventure’, built in 1921 by CCF as CN 1546 ‘Westminster’ a 12 section – 1 DR sleeper. Later in life, CN 94 was re-numbered and re-named CN 1058 ‘Gatineau’ and became part of the CN President’s Business train almost always coupled to Track Inspection Car CN 1060 ‘Sandford Fleming’. Both CN 1058 Gatineau and CN 1060 Sandford Fleming were sold to CP in March 2013 and became CP 2 and CP 1 respectively and were painted bright red. Most recently, CP has repainted both cars in CP maroon and renamed CP 2 (ex-CN 94) ‘Bonfield’.